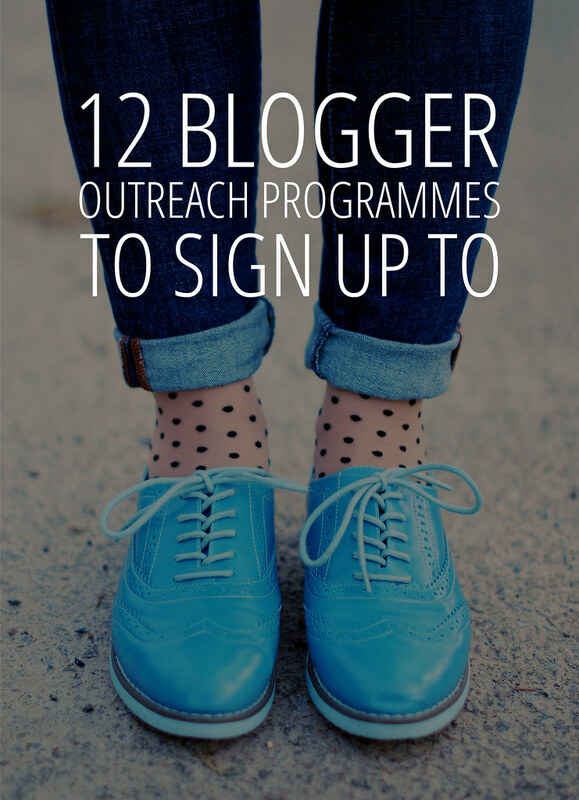 I’ve had quite a few people asking me lately via email and Twitter how to connect with more brands, so as a follow-on from last Saturday’s post about How to Make Your Blog a Success, I thought I’d share the list of blogger outreach programmes I’ve been compiling for the last year or so. The one I would highly recommend as a must for every blogger is Fohr – as well as connecting brands and bloggers they create a profile page for you with automatically updated stats (traffic, social media followers, profile, links to features, etc.). The brilliant thing about this is that you’ve got a ready-made media kit right there – you can email the link for your profile page to brands if they ever ask for updated stats. To see an example, click here to see mine – hopefully it’ll give you an idea of just how detailed it is. Hopefully these will give you a head-start in working with brands – do be prepared to receive a lot of emails, however. I find that I respond positively to about 15-20% of the offers I’m sent, and even then some of those never get back to me (which I don’t understand as they approached me first). Be patient, as it may take a few months for brands to find you – it won’t happen overnight. One last thing: Don’t let the thought that your readership isn’t big enough prevent you from signing up to these programmes. I have read on many occasions that brands don’t just look for blogs with the biggest number of followers or page views: it’s all about fit. If they think your blog and your readership (no matter how small) is the right fit for their brand, they will approach you. P.S. If anyone is reading this from a blogger outreach point of view, i.e. you work for a brand that reaches out to bloggers, please take a moment to read this excellent post entitled “The 10 Most Common Mistakes of Blogger Outreach” – it’ll explain why I hit “delete” so often after reading only a couple of sentences of the email…! Hi! This has been very helpful and I just wanted to say thank you! This was unbelievably helpful. Thank you so much. P.s. I think link numbers 9, 10 and 11 are dead companies. Most useful and really great advice. you helped me alot. I am so thankful. Are these the ones you still recommend? "sending someone a “free” product in exchange for them writing about it and including a link"
is in violation of their guidelines and intended to manipulate PageRank. So make it nofollow, though some PRs and brands will want you to do the opposite of course. Make it very clear before you agree to any collaboration that links will be nofollow so there are no arguments afterwards. Include it in your PR page like I have (if you want to copy my wording be my guest, I don't mind)! Thanks for the reply Catherine, and for clearing this up. This whole blogging business is far more complicated than I could ever have imagined (!) so these blogging tips posts are a massive help. Lisa. Thanks so much for sharing this. Most are for the UK. I looked at the @bloggersrequest too but that is searching for UK bloggers. Would you happen to know of any in the US? Thanks! Shopping Links [shoppinglinks.com] is a great option for global opportunities. We have opportunities posted for the USA, Australia and all across Europe. Great info! Thanks for answering my question too. As I was concerned about a small following. It seems as if these are all for fashion/style/makeup/lifestyle bloggers. . . is that the case? Thanks for posting this I just started writing my own blog and this is a massive help! Great post and very useful. Thanks! Thanks so much for this post Catherine – really great advise. Fantastic lot of links! Lots here I hadn't heard of. I'll be sharing this post on my own social media channels too, I think it's a must read for bloggers. Awesome post, just off to sign up for Fohr Card! Dear Catherine – I notice that a lot of the outreach programs that you have listed are "co.uk"…does this mean they are available for British bloggers only?? And does Fohr Card collect all the data FOR you?? 'Cause I'm embarrassed to say that I don't even know how/where I would find most of these statistics for my blog…boy, do I still have a lot to learn, huh?! Very interesting! Pinned to work on! Thanks for the tips Catherine. You are a generous person to share this. Personally I will not follow them up. As you know, it is strictly hobby for me. But I am sure you are helping a lot of bloggers. I read Henry's article (the 10 most common mistakes etc). Being in the advertising department of a bank, this was highly amusing and recognisable. Not only for blogging. Thanks for this Catherine – you're very generous to share, xox. Great post, Catherine, as always. I also really enjoyed reading the link to the post on what Marketers need not to do. I get the whole Sir/Madam bulk email a lot. As well as the something-for-nothing. It is irritating! I haven't heard of many of these programmes, I'll be sure to check them out!